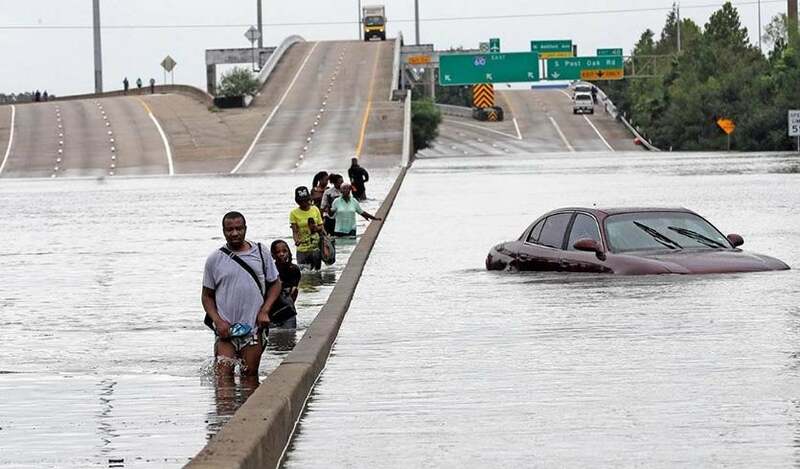 Above: In a haunting echo of scenes from Hurricane Katrina, evacuees wade down a flooded section of I-610 in Houston on Sunday, August 27, 2017, in the wake of Hurricane Harvey. Image credit: AP Photo/David J. Phillip. The devastating hurricane season of 2017 was the most damaging hurricane season in U.S. history, with total damages of $206.6 billion, according to estimates from disaster research scientists Charles Watson Jr. of Enki Holdings, LLC and Mark Johnson of JISC, Inc. The 2017 losses included $114 billion from Hurricane Harvey, $60 billion from Hurricane Irma, and $32 billion from Hurricane Maria. Their 2017 damage estimate surpassed their estimate of the destruction from 2005, when Hurricane Katrina, Hurricane Rita, Hurricane Dennis, and Hurricane Wilma helped drive $151.4 billion in damage. The National Hurricane Center (NHC) and NOAA/NCEI have not yet released their official damage estimates for the hurricane season of 2017. Figure 1. The two most expensive U.S. hurricane seasons since 1871, were they to occur today, would be 2017 (top) and 1893 (bottom.) 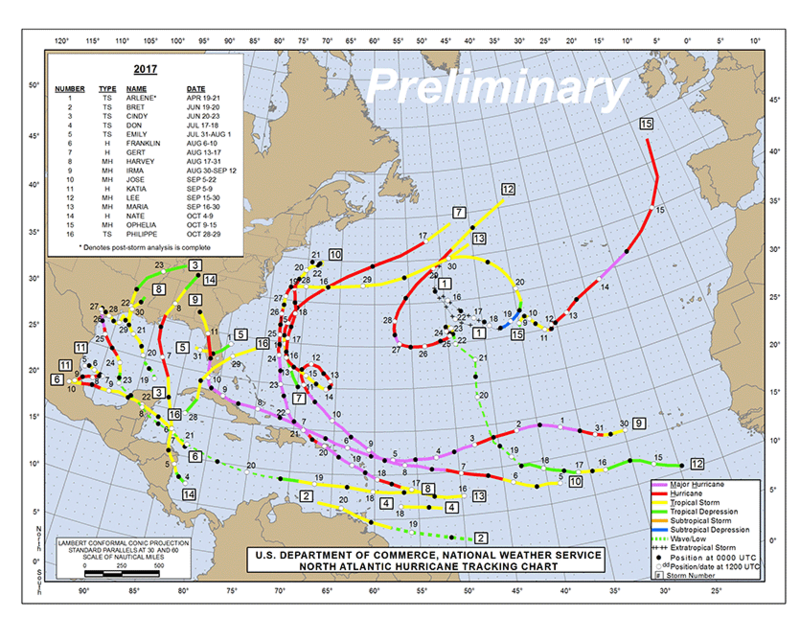 Three major hurricanes hit the U.S. both years: Harvey (Cat 4), Irma (Cat 4) and Maria (Cat 4) in 2017, and the Chenier Caminanda Hurricane (Cat 4), Sea Islands Hurricane (Cat 3), and Hurricane Nine (Cat 3) in 1893. Track image credit: NHC and NOAA/AOML. It’s pretty striking that three of the top ten seasons for U.S. damage have occurred since 2005. If the strongest hurricanes are getting stronger due to global warming—something climate models say we should expect to see—we would expect to see an increasing proportion of the extreme years for damage occurring near the present time, since it is the landfalling major hurricanes that drive the vast majority of hurricane damages. The big wild card, of course, is how many of those intense hurricanes manage to reach U.S. shores. Despite the damage from Sandy in 2012, the U.S. was quite lucky, in retrospect, between 2006 and 2016. Steering currents kept every one of that period's many Category 3 and stronger Atlantic hurricanes from making landfall on the U.S. Gulf or Atlantic coast at that strength. Figure 2. 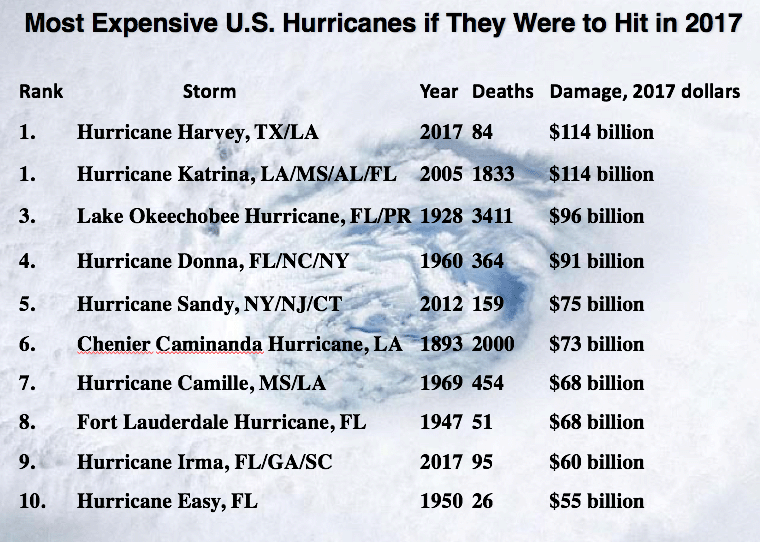 The top ten most damaging U.S. hurricanes since 1871 if they were to occur in 2017, according to research scientists Charles Watson Jr. of Enki Holdings, LLC and Mark Johnson of JISC, Inc. Their research found that the most damaging storm in world history, were it to occur today, would be Typhoon Ruby, which hit Hong Kong on September 5, 1964, as a Category 4 storm with 135 mph winds. Ruby killed at least 730 people and caused catastrophic damage. If it hit in 2017, it would have caused $241 billion in damage. "We've designed a fairly consistent methodology; our numbers are based on physical damage plus unrecovered economic activity after one year. At the high end, things can get really distorted by transitory economic impacts. For example, take the refineries in Texas after Hurricane Harvey. There was a lot of production loss, and some people count that as an economic impact, millions of dollars per day. But, because there was some excess capacity and reserves in the system, production was shifted to west and east coast facilities, and because damage was light to the Gulf facilities, they resumed production at higher than previous levels to restore stocks. So, the *net* effect was relatively little once markets stabilized. A big factor with storms like Sandy is that once politics gets involved, mitigation and extraneous expenditures get counted against a storm. We've also found that there is significant underestimation of economic impacts at the low end. Evacuation disruptions are rarely counted outside of areas impacted by a storm, and because of the way deductibles work, lots of damage at the low end is not tracked by the insurance industry and therefore not counted (the new 2% "named storm" deductibles in coastal states have made this worse). Thus, cleanup tends to be done ad hoc, rather than as big formal projects with accounting."